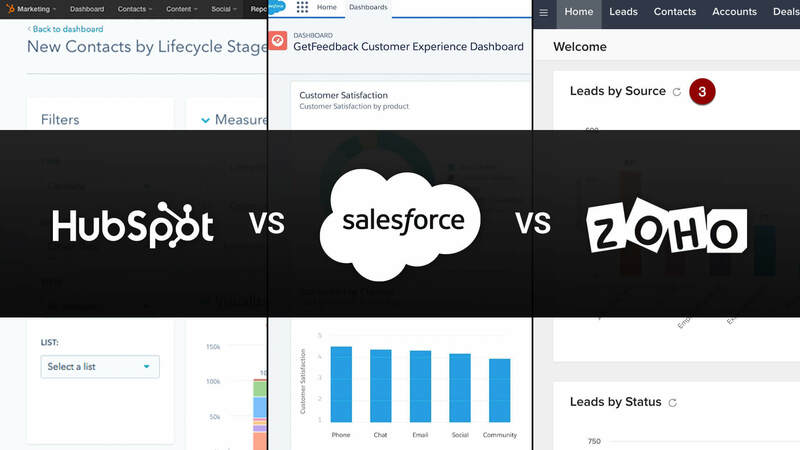 The Best CRM For Your Ecommerce Business: Salesforce, Zoho, or HubSpot? What is a CRM? In short, a CRM (customer relationship management) is a system used to manage client interactions. CRMs are essential for businesses to have, regardless of the industry. By using a CRM, you are able to gather and store important information on clients or prospects; which, in turn, allows you to maintain the best possible relationship with them. It is important to customize your CRM to your specific needs and take full advantage of the analytics and reporting that your CRM provides. While there are a wide variety of CRMs on the market, below are three great options to choose from if you are an ecommerce business. Known as the largest CRM currently on the market, Salesforce is great because of how customizable it is. Salesforce is the perfect out-of-the-box solution for a small business, and it is scalable as your company grows. When setting up Salesforce, there are many in-app tutorials to guide you along the way. That being said, out of CRM platforms, it doesn’t have the prettiest user interface. Performance over appearance is definitely the focus, as it should be, but this can create a rather clunky experience for anyone using it. This impact on user experience can create a steeper learning curve, as certain actions may not be as intuitive as one would hope. Salesforce is extremely versatile in the way your sales team can set up features. You can log calls, emails, and activities that can then be put together into a report allowing for KPI tracking. Another useful ability is the option to set future activities. For instance, if you know that a prospect is interested but unable to speak at the moment, you can set a follow up. A list of follow ups can then be pulled up in one report. This becomes extremely useful because it allows you to plan strategies around prospect outreach. Artificial Intelligence, or A.I., is becoming a major feature with the top CRMs, and Salesforce’s Einstein is taking it to the next level. Salesforce’s A.I. software has the ability to analyze data in real time and use that data to provide valuable insight. Einstein Voice is a mobile component that allows you to call leads, log meeting notes, enter them into Salesforce, and even create custom bots based on your needs. As the name implies, this is all done through voice commands that you give out loud using your phone’s microphone. It’s a very unique and convenient perk of Salesforce. Zoho is another CRM pushing A.I. through Zia, the platform’s sales assistant. It uses predictive learning in order to analyze a sales representative’s data and tasks to calculate the likelihood of a deal closing. By comparing data against previous information and patterns, it is able to provide a sales forecast for your team. On top of this, Zia can also conveniently automate repetitive tasks. The user interface for Zoho is straightforward and customizable, which is great because it is aimed towards small to mid-sized businesses. While there is a support team to help guide you with any questions that might come up, customer service is not as consistent as one would hope. A huge perk with Zoho is the ability to link with your company’s social networks. This is key as social networks have become a driving force in the way that ecommerce companies market to their audience. This is the driving reason why their Enterprise tier, starting at $35 a month per user, is so popular. However if you aren’t quite sure about commiting, they also include a Free Edition that offers the platform’s basic features for free up to three users. Zoho can integrate with your ecommerce site and allow you to capture website visits and push them directly into your CRM, which keeps customers from slipping through the cracks. Interestingly enough, Zoho is able to analyze incoming emails and evaluate their tone – not that your team should have trouble doing this. HubSpot has very quickly become a favorite amongst CRM platforms for several reasons, one reason being that it is free. You can get started with HubSpot by simply signing up. There are additional paid tiers, the Professional and Enterprise tiers unlock more features. The platform itself has as a great interface that is easy to navigate and is extremely intuitive. It also easily integrates with the popular ecommerce platforms, including Shopify and WooCommerce. Pipelines can be created for the various stages of your sales funnel. You can use reporting to track your clients through the pipeline, and use HubSpot’s email plugin to aid your sales process. Setting up this plugin allows you to sync your emails with HubSpot. From there, you can log, track, and look up contacts. You can set up snippets and templates that you frequently use in order to automate repetitive tasks, allowing your sales team to work more efficiently. Your emails are directly pushed to HubSpot, removing the often annoying action of having to log them into your CRM later. Hubspot does not shy away from providing you with information on how to make the most of their platform. They literally have thousands of articles from how to create snippets (repeatedly used phrases) to walking you through what makes a successful pipeline and how you can create one for your own ecommerce business. Regardless of what CRM you choose, make sure that it has a solid mobile platform. Salesforce, Zoho, and HubSpot all have mobile apps. This is important for pulling information on a client or account while on the road, and this can be critical to closing a deal. We’ve always found great success with HubSpot. Not only do we use it as our own internal CRM, but we’ve recommended it to most of our clients looking for a CRM. HubSpot is very malleable and can be customized to work for most businesses. It is important to make sure your CRM is working for you. What you put in is what you get out, so all of your incoming sales information needs to be accurately documented. To sales teams looking to hit quota; it is key to always stay honest and make sure everything makes it into your CRM. If your CRM works for you and automates this process, there is less room to miss anything.